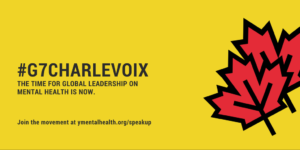 MHE is pleased to support and sign the Global Coalition on Youth Mental Health ‘Letter of Support to G7 Leadership’ to make mental health a priority worldwide. The letter calls for a sustained G7 commitment to address the impacts of mental ill health on youth around the world. Mental health, particularly youth mental health, is inextricably linked with the G7 official themes this year. Yet, G7 leaders have not yet focused on mental health as a global priority.